Even with the front driver and passenger seats move all the way to the back of their tracks and reclined somewhat, there is still plenty of legroom for backseat passengers (even 6 footers). This is really a full size sedan and not a mid-size. Full coverage insurance is relatively inexpensive. 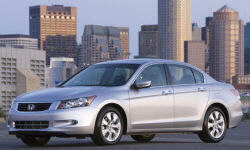 This newer model of Accord holds its value quite well. Front seats offer plenty of range of motion. They are comfortable for extended periods of time. Side bolsters are not too soft, not to rigid. Just right. There are flat out no incentives for this vehicle, at least not when I purchased it. Inline 4 is moderate at best. Offers ample passing power but only at full throttle. The automatic transmission leaves much to be desired as far as shift points are concerned. It often searches even when you put the pedal down. Many corners are cut on the car. Such as: no underhood trim, no trim under the trunk lid, no driver and passenger lower trim covers, lack of a "close" function on the A/C vents on the center console stack.